There’s an easy way to start building raised garden beds and make them productive as you build. Growing potatoes in old tyres as you raise your edges around them gets your raised garden bed growing as soon as possible. For an even easier head-start check out these raised bed garden kit reviews. The raised edges help reduce your crop’s competition; weeds, pests and diseases. Good soil, fertilisers and mulches are concentrated in the actual growing area. Raised garden beds contain soil and mulch neatly without spreading onto paths. You can build up the ideal soil conditions by adding a trailer-load of soil, or gradually building up the layers of your raised garden bed using compost, green manure crops and mulch. 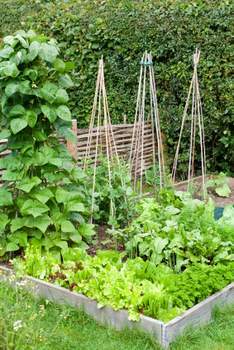 Many gardeners find raised garden beds more accessible as there’s less bending over. You can sit and garden rather than wearing your knees out kneeling. The clear boundaries of raised garden beds also look really neat and beautiful, and add to the aesthetics of your garden. Allows build up of good quality soil, and better drainage, especially if your soil base is heavy. Raised garden beds are especially good if you’re using a non-dig system – always my favourite! You need to dig even less when you don’t have to walk across your garden beds, compacting the soil as you go. You don’t need a huge space for your raised garden beds, 3-4 square metres is ample. Ideally build your raised garden bed in a position that gets full sun for at least 5-6 hours a day. 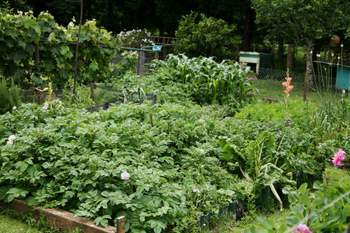 If your yard is shaded by neighbouring buildings or trees don’t worry, many vegetables and herbs will crop with less, you’ll just have to be more selective. If your bed is rectangular, try to orient it north south so that you can plant tall crops along one side to avoid shading. Building raised garden beds close to your house makes it easier to pick herbs and vegetables while you’re preparing food. Make sure you can reach the centre of the bed – part of the advantage of raised garden beds is that you avoid compacting soil by walking on it as you work. If you’re building a number of raised beds make sure you leave a path wide enough to get a wheelbarrow through. Raise the edges between 10-30cm high. If you want to avoid bending raise them even higher to about 50cm-60cm. Be aware that soil will generally dry out faster on the edges of raised beds. This is great technique for gardeners with little time, because you can get your food crop started straight away and construct your raised garden bed around it. The bounty of your potato crop will inspire you to keep building if you lose momentum halfway. Get a number of old tyres from the tip or your mate’s yard, an even number is ideal for a rectangular bed. Arrange the tyres in a square or rectangular grid in the location of your planned raised bed vegetable garden. 1x2, 2x2, 3x2 and so on, depending on the space you have. Check this page for further instruction on how to grow potatoes. This also gives you the ability to experiment with the position of your bed by moving the tyres around until you’re happy. The idea is that you can use the tyres as planters for your potato crop and build up the bottom layer of soil for your raised garden bed at the same time. Potato crops are ideal for breaking ground, and one of the best crops for improving soil as they require good manuring. Using mulch that breaks down quickly, such as pea straw, will also help raise the soil level of your raised garden bed. As your potatoes are growing, frame the edges of your raised garden bed around the tyres. 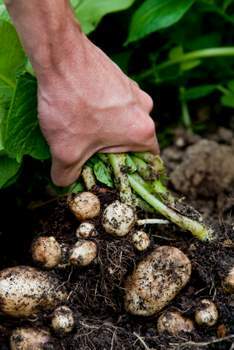 Lift out the tyres when you harvest the potatoes and spread the soil as the first layer of your raised garden bed. Then you can add a layer of soil to continue building up the level of your raised bed and plant your next crop. Don’t follow potatoes with tomatoes, eggplants or capsicums. Instead choose leeks, onions, garlic, shallots, peas, beans or root crops. If you’re really pushed for time and can’t get a crop in, scatter a green manure crop such as lucerne, buckwheat, soybeans or broad beans to increase the fertility of your soil. You can dig this in later when you’re ready to plant, or cover it up with your next layer of soil or mulch. If you’d really like to get started quickly, consider purchasing a raised bed garden kit. You can still use this in combination with the potato growing method, but will be able to build the edges of your garden bed much more easily. The advantages here are that materials and instructions are provided, and construction is more straight-forward. Of course this will cost more than salvaging edging materials from the tip. Building raised garden beds for growing vegetables is worth the effort - you'll be rewarded with fresh, healthy food for years to come.